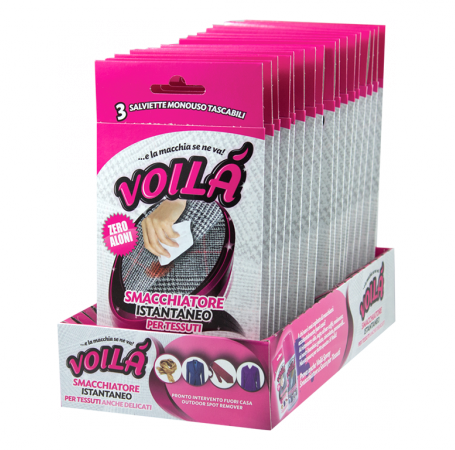 Voilà wipes which is ideal EMERGENCY STAIN AWAY, can also be used on delicate fabrics such as wool, cashmere and silk (which is not recommended to use spray dry). It can also be used to clean car seats and textile furnishings not easily washable like sofas, armchairs, carpets, carpets and curtains. It Contains 3 WIPES spotting in SINGLE bags. You can carry it comfortably with it in suitcase, bag, pocket, always and everywhere!. Remove any solid dirt residues. Wipe the towel from the outside to the inside of the stain and wait for the fabric to dry. If necessary, repeat the operation using the same wipes if it is still wet (it may be re-humidified with water). The product increases its effectiveness when used in still stain. For colored or particularly delicate fabrics, it is preferable to pad the wip on the stain and, if necessary, rub gently, it is also good to try the wiping cloth in a hidden corner of the head first. On all type of Clothes and complements not easily washable such as sofas, armchairs, carpets, carpets and car seats. Single Wipes which makes it possible, with one simple gesture, to eliminate sauce, grease, tar, fruit juice, makeup, ballpoint stains and so on instantly from fabrics. When used with lukewarm water and soap it removes sweat, grass, milk, ice cream and chocolate stains, and so on.